Follow these designer-approved guidelines to make the most of every bit of space in your kitchen. 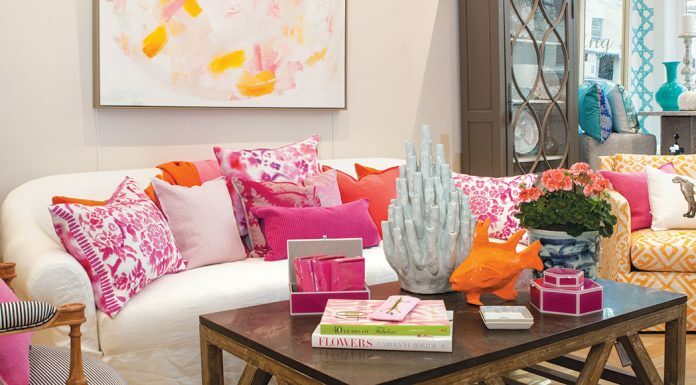 Come spring, designer show houses seem to pop up around the country. The homes, usually older and for sale, are redone by various interior designers who are given free rein. An entry fee is collected from visitors and proceeds donated to a specific charity. This kitchen was in a grand, old house and proceeds benefited the local symphony. 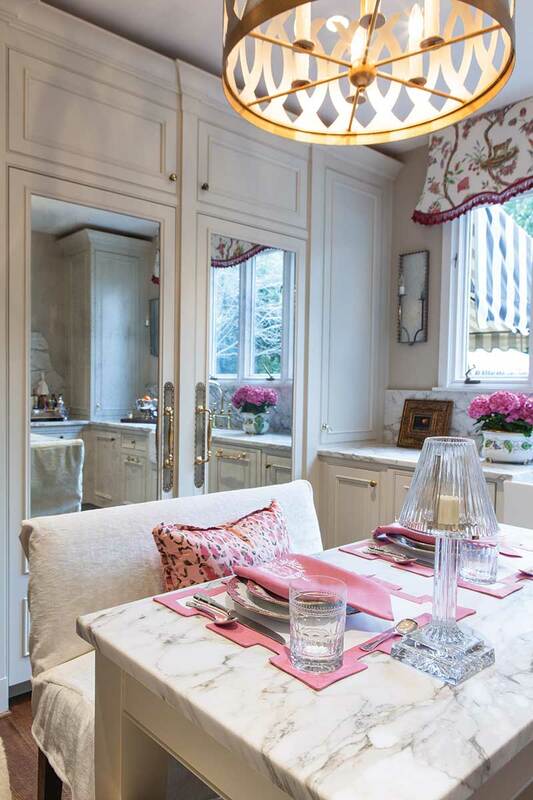 Cyndy Cantley of Cantley & Company made the most of this quaint kitchen by following a few simple designer-approved guidelines. 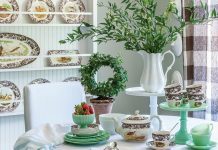 Check out her tips below then read on to discover how she incorporated them into this charming kitchen. Keep everything in the same color family—just go up and down with the shade. Wallpaper the ceiling to bring your eye up. Add mirrors to give the illusion of more space. Use the same materials for counters and backsplash. Hang a large piece of art or add a large stove hood as a focal point. 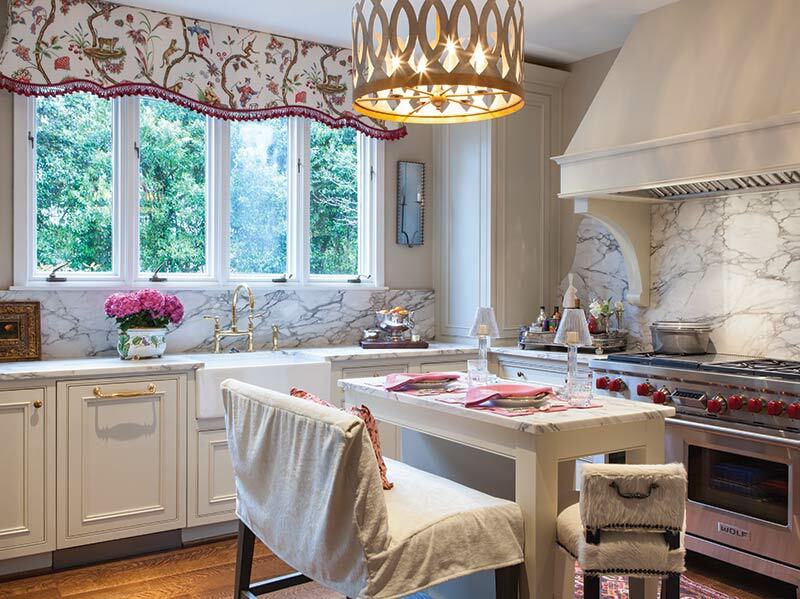 “Show houses always are fun to do because you can do what you want,” says kitchen designer Cyndy Cantley of Cantley & Company. This particular home was very dated and the kitchen was tucked away as so many were in decades past. In an effort to preserve the home’s architectural style Cyndy didn’t want to take out walls, but she did want to make it as much of a family kitchen as possible. In the 14 x 14-foot square room, the swinging door was removed and the cased opening enlarged. Cyndy was able to squeeze in a small island to add a little seating area that she says is nice for both kids and conversation. Large cabinets extend to the ceiling and sit on the countertops. There is also a tall dish pantry that can hold the equivalent of eight cabinets. “The pantry is more usable than regular cabinets because everything is reachable,” Cyndy says. With plenty of storage, everything can be put away and an uncluttered counter helps any kitchen appear larger. She chose brass knobs and handles for the cabinets. “We often use old brass knobs and pulls that we have reworked. This is not the old shiny brass of the 70s. The ‘new’ brass is not lacquered and keeps getting prettier with age,” according to Cyndy. Why pink for the kitchen color palette? Cyndy says she was just working to her audience. She knew there would be lots of women touring the home and she feels deep down ladies love pink. These particular linens are some of Cyndy’s favorites that she brought from her own home.